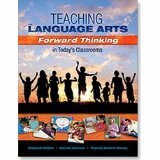 Teaching the Language Arts: Forward Thinking in Today’s Classrooms by Elizabeth Dobler, Denise Johnson and Thomas DeVere Wolsey. Published by Holcomb Hathaway, ebook available via Inkling platform. When I received a copy of Forward Thinking I was immediately struck by the calibre of the authors (Elizabeth Dobler, Denise Johnson and our own Literacy Beat blogger De Vere Wolsey). In turn, each author is well respected within the literacy community for situating their research in classrooms and making strong research-to-practice connections. The six modes of the Language Arts- reading, writing, listening, speaking, viewing and visually representing provide the organisational framework of this etext. However, it is the enhanced etext publishing format which I want to particularly draw attention to in this post. A number of distinctive features encourage active learning environments by combining traditional and electronic content. These features allow the reader to transact with the text in multiple ways through media elements such as, video, graphics, and audio which are embedded in the etext. Readers can watch lessons being taught in real classrooms; have instant access to multiple resource ideas that are shared through video clips (e.g. writing workshop); listen to podcasts of teachers and students; view graphics of work samples and follow hyperlinks to websites. In addition, links between research and practice are featured in interviews with scholars like Don Leu, Dorothy Strickland and Nell Duke. Finally, the etext incorporates a note sharing feature which could be used to create pathways to learning through listening, reading and viewing within a community of learners. The authors of Forward Thinking note that the book models ways in which electronic resources can be integrated with and used to augment traditional classroom instruction. Forward Thinking allows us envision the possibilities when technology is integrated in meaningful ways to enhance literacy and learning in the 21st century classroom. Bernadette, thank you for the kind words about our book. We really wanted to bring the elementary classroom to life for novice teachers through text, video, and audio. Thanks for recognizing our efforts. Thank you for your review of Forward Thinking, regarding the use of multimedia digital books used within the classroom. As a college student studying childhood and special education, this is most definitely a topic of interest to me. As apart of one of my literacy curriculum classes, we have been using iPads in our lessons. Specifically, we have been sharing eBooks with students in small groups. Over the course of four lessons, the iPad has definitely been a value resource to have, and the students have responded well. I believe that just as you said “Forward Thinking allows us to envision the possibilities when technology is integrated in meaningful ways to enhance literacy learning in the 21st century classroom,” the iPad allows the same opportunities as well. We also talked a lot about multimodal literacy. Today especially, digital print is everywhere. Therefore, it is important students know how to access relevant and reliable information. Students should most definitely be accustomed with the technology used today because students will need these skills in the future. I would definitely like to read more about Forward Thinking, it seems like a worthwhile investment to have in the classroom.